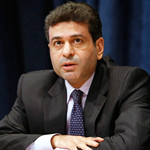 Mr. Nour is currently the Director of the United Nations Regional Commissions’ Office in New York. In this capacity, he is responsible for providing strategic policy advice on a broad array of economic and social development issues on the global agenda with a bearing on the regional work undertaken by the Regional Commissions. He is also leading inter-regional coordination and collaboration efforts among the Commissions. Before joining his current functions, Mr. Nour worked as a research and evaluation officer at the United Nations (UN). He conducted in depth UN system-wide programmatic and technical cooperation audits in the field, in addition to management evaluations, including on results-based management and reform in the UN system. Prior to joining the UN, Mr. Nour worked as a diplomat advising the Government of Egypt on issues of foreign policy. His portfolio included, among others, the political economy of energy, trade-related issues and negotiations, as well as the sustainable development agenda. Mr. Nour also covered in-depth a number of political issues, including as a delegate to the Security Council. He represented his government in several global conferences and UN main and subsidiary bodies and led negotiations on behalf of several political groupings at the UN. Mr. Nour carries a Masters in Public Administration from Syracuse University, United States; a Masters in Political Science from the University of Paris I/Sorbonne, France; in addition to Law and Engineering Degrees from Cairo University, Egypt. He also carries post-graduate certificates in international law and Middle-Eastern studies.